After going undrafted in the NFL Draft, Ken Griffey Jr.’s son Trey found a home with the Indianapolis Colts as a part of their wide receiving corps. 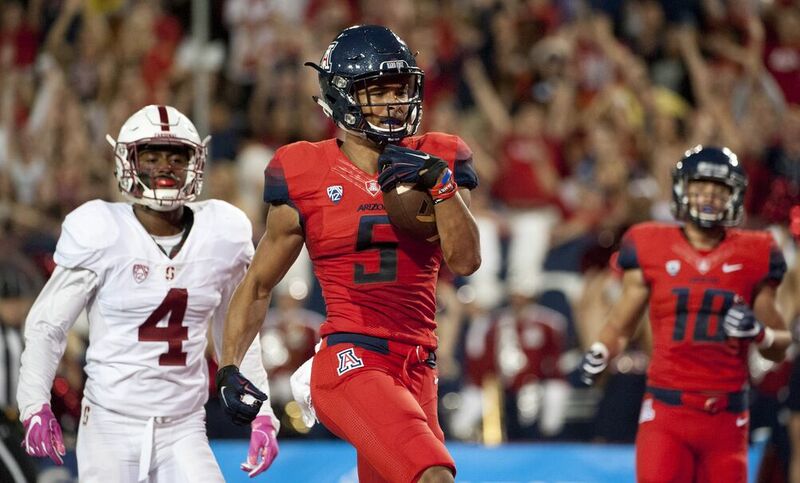 Trey Griffey, an undrafted free-agent wide receiver from Arizona and son of baseball legend Ken Griffey Jr., was signed by the Indianapolis Colts on Sunday. The news was confirmed by Griffey’s sister on Twitter after being reported on Saturday night. Trey Griffey joins an already loaded group of wide receivers for the Colts, who find themselves with names like T.Y. Hilton, Donte Moncrief and Phillip Dorsett ahead of the undrafted rookie. The 6-foot-three, 23-year-old receiver, played in 44 total games, with 79 total receptions for 1,241 yards and six touchdowns, averaging 15.7 yards a catch. He recorded 23 receptions, an average of two catches a game, for 382 yards and two touchdowns in his last season with the Wildcats, and posted 31 catches for 405 yards in 2014. While Griffey didn’t get drafted by an NFL team, he has experienced the feeling of being drafted in a professional league before. Griffey was signed by his dad’s former team, the Seattle Mariners, in the 2016 amateur draft. He was picked in the 24th round, matching the number his dad famously wore for the Mariners in his time with the team, as an honor to his father, but committed to play football rather than his dad’s sport. To go along with the wide-ranging family ties in sports, Griffey’s sister and Griffey Jr.’s daughter Taryn plays basketball at Arizona after being recruited by many of the top programs in the country. The Colts are surely hoping they can get the same production from the 23-year-old as his dad did in his 22 years in the MLB. A Hall of Famer of the class of 2016, Griffey Jr. had 630 career home runs and was a 13-time All-Star in the league.